No matter what product your discrete manufacturing business produces, you are probably facing similar challenges in today’s competitive market – constant changes in trends and consumer tastes, complex global supply chains for raw materials, and the exacting demands of new safety and environmental regulations. Enterprise Resource Planning (ERP) software helps you keep your competitive edge by establishing a lean manufacturing process that responds to client demands, stream lines processes to reduce waste, and provides timely data and analysis that help make smarter decisions that impact revenue. 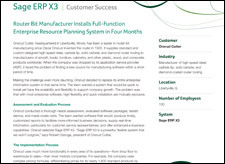 Today’s ERP software supports all of your planning, scheduling and production control activities while flexibly adapts to diverse manufacturing modes, including make-to-order, configure-to-order, assemble-to-order, make-to-stock and mixed-mode environments. Information dynamically updates as transactions occur for smarter, faster decision making across the board. Look for real-time control and visibility of production schedules, capacity, shop floor activities and an overview of cost control. The ERP you choose needs to be flexible and powerful enough to allow you to switch from make to stock to make to order and mixed order. ERPs help reduce inventory losses by tracking and accounting for your inventory. If you are an average manufacturer, plan on reducing your shrinkage to a rate of one percent. Labour hours can be reduced by faster and streamlined processes, while reporting and analysis time is cut by reporting generated through integrated databases that capture manufacturing, distribution and financial data. Collaboration between colleagues, partners, suppliers and vendors is essential to a productive and cost efficient manufacturing process. Quick and responsive information flow systems, adaptable to each new project, can help you define and track the tasks, monitor time and manage costs. This improves the new product development process through better collaboration between R&D and production departments. Increased competition means keeping existing customers happy and adding value to your product and services. An integrated CRM system allows salespeople to promise deliveries based on actual capacity while ensuring that each deal is profitable. Some systems also allow salespeople to access the system from their mobile devices, ensuring that they capture customer needs and get answers for customers immediately. Management can track the sales funnel dynamically and make decisions accordingly. The CRM helps to quickly determine order status and product availability, and to maintain a progress report and financial balance sheet for each project. The CRM also helps with after-sales support service by monitoring of equipment delivered to each customer and analysis of all activities. Need help assessing your ERP needs? 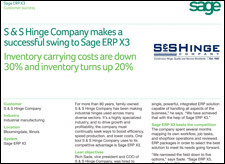 At the IWI Consulting Group w help you assess which SAGE ERP works best for your business. We provide customized assessments that give businesses sustainable ERP systems that have helped turn businesses around. In our experience, most companies save ten to 30 percent on inventory holding costs alone, a considerable ROI in any circumstance. With the challenging economic climate today, adopting practices that increase revenues by optimizing operations is a choice that pays.